A mechanic's lien (sometimes called a construction or contractor's lien) is a remedy available to contractors, subcontractors, laborers, and material suppliers to help recover money due, but unpaid, for services or materials on a construction job. In many ways, a lien is a property interest like a mortgage. 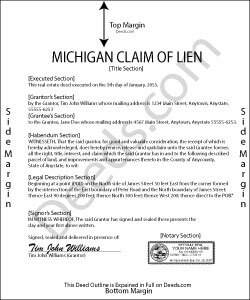 In Michigan, the Construction Lien Act (Act 497 of 1980) governs the procedure for obtaining this kind of lien. In order to preserve the right of a contractor, subcontractor, laborer, or supplier to a construction lien, the contractor (or other claimant) must record a claim of lien within 90 days after the last furnishing of labor or material for the improvement, in the office of the register of deeds for each county where the real property to which the improvement was made is located. M.C.L. 570.1111(1). A claim of lien is valid only as to the real property described in the claim of lien and located within the county where the claim of lien has been recorded. Id. It must contain the following information: (1) the date of first furnishing; (2) lien claimant's name; (3) name of person contracted with; (4) description of the subject property; (5) owner's name; (6) date of final furnishing; and (7) contract and payment amounts (if contractor) or hourly rate and sum due (if laborer). M.C.L. 570.1111(2). Attach proof of service of a Notice of Furnishing to a lien claim filed by a subcontractor, supplier, or laborer. M.C.L. 570.1111(5). The lien claim must also be served after recording. Service refers to giving all interested parties notice of the action and an opportunity to be heard. Each contractor, subcontractor, supplier, laborer, or agent of a group of laborers who record a claim of lien must, within 15 days after the date of the recording, serve on the designee personally or by certified mail, return receipt requested, at the address shown on the notice of commencement, a copy of the claim of lien and a copy of any proof of service recorded in connection with the claim of lien. Id. This article is provided for informational purposes only and should not be relied upon as a substitute for the advice of an attorney. If you have any questions about filing a claim of lien, or any other issues involving mechanic's liens, please consult with a Michigan-licensed attorney. edward m. said: I would rate it 5 stars also. Eddie M.
Kay G. said: Found just the form I was looking for. It was an easy download process. Now just have to complete the forms! Reply from Staff: Thank you for your feedback Kay, we really appreciate it. Reply from Staff: Thank you Mary, we really appreciate your feedback. Reply from Staff: Thank you Irene. Reply from Staff: Glad to hear Lisa, we appreciate you taking the time to leave your feedback.